Mike McLain, with 39 years of industry experience, is the General Manager of Bay Insulation Systems, Inc. (www.bayinsulation.com) the largest laminator and supplier of metal building insulation in the United States. Mr. McLain is the former Chair of the National Insulation Association’s (NIA’s) Metal Building Lamination Committee and former member of the Metal Building Manufacturers Association (MBMA) Board of Director’s Executive Committee. He currently serves on the MBMA Communications Committee and is a member of the MBMA Energy Committee Leadership Team. Mr. McLain has devoted a significant portion of time during the past 4 years leading the effort to promote the benefits of fiber glass insulation in insulated roof and wall assemblies for the industry. He can be reached at mmclain@bayindustries.com. Caption: This warehouse uses a 2-layer filled cavity (FC) system consisting of a first layer of fiber glass laminated to the vapor barrier that is installed from the top between the purlins supported by banding attached to the bottom flange of the purlin. The second layer is unfaced and installed over and perpendicular to the purlins with the thermal block above the purlin. In recent years, there has been a remarkable shift in the performance expectations for roof and wall envelope in metal buildings. The United States Department of Energy is taking bold and necessary steps that will improve the energy efficiency of residential, commercial, institutional, and industrial buildings. For decades, there have been very few modifications to the codes and standards regarding the performance of the building envelope in terms of improving energy consumption with respect to heating and cooling the structures. The new and more stringent standards in ASHRAE 90.1-2013 shall ultimately become law through adoption by building codes, which will be powered by the requirements contained within the International Energy Conservation Code (IECC-2015). These new standards mandate that every element of the building envelope be evaluated for its impact on thermal performance and relative cost. Part of this process has been the evolution of “whole building” or “assembly” analysis, whereby each component is now evaluated as part of the whole. This has driven a transition from the prior practice of just evaluating the thermal performance of components (R-Value), to that of the entire assembly (U-Factor). There is now a need and capability for more linkage between the various disciplines within the regulatory, design, detailing, and construction phases of building projects through the implementation of new computer-driven programs that scientifically evaluate a structure’s performance from more perspectives—in particular those associated with overall energy consumption. Finite Element Analysis (FEA) is one of these powerful digital concepts and tools that has recently been gaining acceptance and a rightful position is assisting design teams to optimize the performance of roof and wall envelopes. Caption: A cross-section of a liner system consisting of a single vapor barrier covering the entire bay, supported by banding at the bottom flange of the purlin. The first layer of fiber-glass is installed in between the purlins supported by the vapor barrier. The second layer, as with the LTB system, is installed over and perpendicular to the purlins with the thermal block above the purlin. 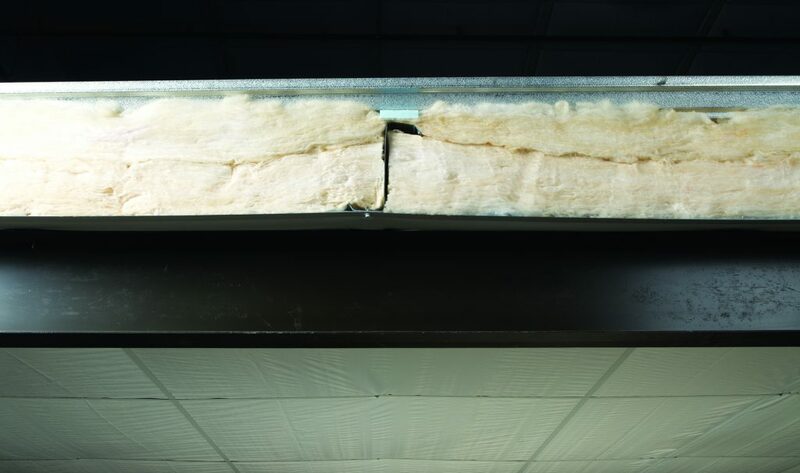 This higher level of scrutiny has placed emphasis on conditions such as thermal bridging, where highly conductive components (poor thermal insulators) of a roof or wall assembly short circuit the insulation system. Looking at the R-Value of the insulation alone is not enough. The influence of thermal bridging on the overall thermal performance must be considered. The analysis of thermal bridging has led to the development of thermal breaks, a component of an assembly with low thermal conductivity that mitigates the presence of highly conductive areas of the structure’s envelope. The concept of utilizing thermal breaks is not new, but has become critically important in achieving the high levels of thermal performance now mandated by code. Thermal breaks are an integral part of tested assemblies that have been developed to be compliant with today’s building envelope requirements. polyisocyanurate is also available. Typical specifications call for the thermal block to have a minimum R-value of 3.0 (ASHRAE 90.1-2013). Metal buildings typically have a much larger roof-to-wall ratio than other structures. As a result, the thermal performance of the roof has a significantly larger impact on the overall thermal efficiency of the building envelope. Back in the 1970s, when thermal blocks first became available for standing-seam roofs, both were considered an extravagance because they added cost to the structure and were perceived to offer little return on the investment—nothing could be further from the truth today. A standing seam roof, in combination with light-density fiber glass insulation and thermal blocks, provides cost effective insulation options that comply with stringent codes for non-residential, low-rise construction, and continues to outperform other roofing options. Combining a properly insulated standing-seam roof with low-density fiber glass and a thermal block establishes the required thermal break between the top flange of the purlin and roof panel. 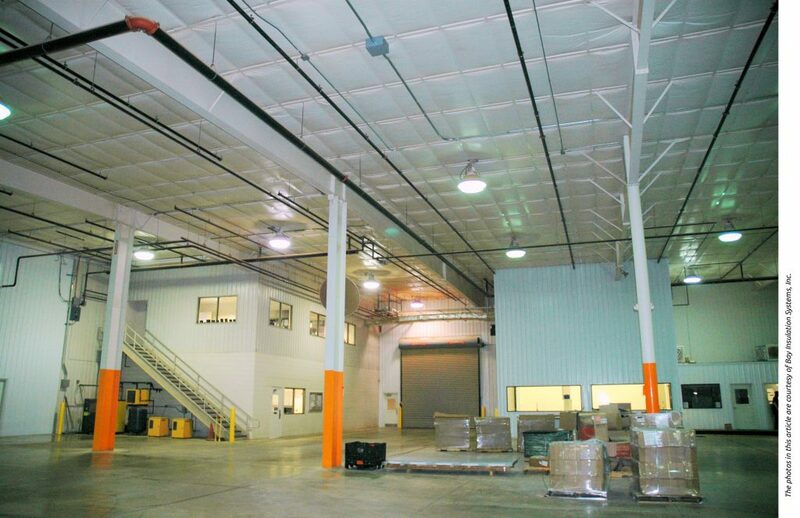 Metal buildings provide the highest value for non-residential, low-rise structures. Part of this value is due to the fact that they are easy to insulate with a relatively inexpensive insulation (considering cost per installed R-Value). Standing-seam roofs, with fiber glass insulation and thermal blocks, lead that value proposition and remain the most cost-effective method to meet even the most demanding requirements of the new codes. All single and double layer insulation systems under a standing-seam roof should use a thermal block. The performance/cost difference between one with and without is staggering. In order to be compliant with the new energy codes, it is necessary for the insulation system to fill the purlin cavity. There are 2 effective ways to accomplish this requirement: a Long Tab Banded (LTB) system (filled cavity) or a liner system. The banding grid for the LTB system is perpendicular and fastened to the bottom flange of every purlin prior to installing the insulation with spacing at 30”. The banding for a liner system is attached in a different configuration. First, a liner system needs 1 or 2 longitudinal lengths of banding that run from end to end of the building (in between and parallel to the purlins). They are attached only at the very end frame rafters and rest upon the intermediate rafters. In addition to that banding, this system requires a similar banding configuration as used for LTB and runs perpendicular to the purlin, but on 60” centers. These runs of banding are initially attached only to the eave and ridge purlins, so the single panel of facing, which covers the entire bay from eave to ridge and rafter to rafter, can be spread out and adhered to the top of the rafters. Once the facing is spread out, the lateral bands (running eave to ridge) are then attached at all intermediate purlins between the eave and ridge. Once installed, a liner system can also provide fall protection that meets Occupational Safety and Health Administration (OSHA) requirements. Fiber glass insulation and thermal blocks are installed in a similar manner as with the LTB system. Thermal blocks have traditionally been used exclusively in the roof, but can now be found in high-performing wall assemblies as well. Thermal tape, a closed-cell product, has also proven effective in wall applications where fiber glass insulation is present. Thermal breaks contribute significantly to the capability of the referenced code compliant solutions, and can be an effective tool in achieving code compliance in metal buildings.